Phase transitions between different states of matter are normally driven by random thermal motions of atoms. However, when phase transitions occur at temperatures approaching absolute zero, quantum mechanical fluctuations begin to take over, sometimes with extraordinary results. Yasuyuki Kato from the RIKEN Center for Emergent Matter Science and other RIKEN colleagues have now computationally uncovered 'tricritical' transition points that help explain the quantum phase transition in superfluid-to-insulator systems. Quantum interactions are inherently 'fuzzy'—particles, for example, can develop overlapping states of both order and disorder. This means that materials can emerge from quantum phase transitions with exotic macroscopic characteristics. One such transition is that of insulating binary mixtures of ultracold gases, optically trapped in a three-dimensional pattern using laser light, to superfluids that flow without friction at temperatures near absolute zero. 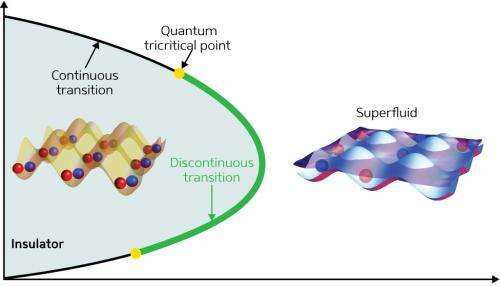 The transition between two quantum phases can either be first-order, where physical properties change suddenly or discontinuously, or second-order, which describes a more continuous and gradual conversion. Tricritical points arise when second-order phase transitions switch to first-order transitions and understanding how they form can be a useful strategy for discovering new types of quantum matter. Unfortunately, quantum critical states are extremely complex and difficult to spot using experimental techniques. As Kato notes, it is difficult to recognize tricritical points even using numerical simulations because near such points, first-order discontinuities are very small. Kato's team simulated fluctuations in atomic density during the superfluid-to-insulator phase transition in a Bose–Hubbard system using quantum Monte Carlo (QMC) algorithms. The application of QMC methods to determine tricritical points has proved difficult in the past. Kato and his colleagues circumvented the problem by precisely calculating the system's second-order stability-limit line, and performing QMC simulations only along this line (Fig. 1). They then analytically derived how tricritical points would be expected to behave using quantum field theory. The findings revealed that tricritical points appear when the transition temperature of the superfluid becomes noticeably dependent on the potential energy of the trapped atoms—a point at which significant fluctuations in atomic density also emerge. Since both of these features can be directly observed in existing optical traps, the researchers are confident that experimental verification of this discovery will soon follow. "Optical lattice systems offer high controllability to investigate our quantitative model or even higher order multicriticality counterparts," says Kato. The insight offered by the discovery could eventually prove invaluable for future applications of quantum processes, such as in quantum computing.